Those looking to learn amore bout Spanish wine, and who are cool with receiving a freebie (I really hope that covers most of you out there) might want to check out Far from Ordinary, a free guide to Spanish wine available through Wines From Spain. Wines From Spain is another government-funded promotional program with the objective of promoting a country’s wines and its wine regions (in this case, Spain – duh) to wine consumers worldwide. We’ve been seeing a lot of those organizations hitting the promotional trails lately, especially since the world economy took a sharp turn towards toiletville. Far from Ordinary was written with the help of uber-wine guy Doug Frost, who is one of a (very) small handful of people to achieve both the Master Sommelier and Master of Wine credentials. Frost also supplies the tasting notes for the 130+ Spanish wines featured in the guide. Personally, I’ve little experience with Spanish wines and it ranks right up there with Burgundy on the list of world wine areas that I need to learn (and taste!) more about. Apparently it has me in such a tizzy that just thinking about it causes me to end sentences with prepositions. Having said that, Spanish wine – when you can find it in the States, that is – is a hell of a lot easier to navigate than Burgundy in terms of not breaking both your heart and wallet when you find a dud. So, I’ve only got experience with a small amount of the wines featured in Far from Ordinary but I found the selections with which I’m familiar to be good buys and consistent with Doug Frost’s tasting notes (there – that sentence was better… whew…). A primer on the major winemaking regions of Spain is also provided in the guide, and it’s bursting out with photographs so stunning that they might better be placed in a Spanish tourism guide – some of the shots will make you want to immediately open a bottle of Cava or Priorat and book travel to the Spanish countryside. The guide is certainly worth a look (the price, after all, is right). This magical land of Spain of which you speak, is it accessible by rail from the storied country of Andorra?? After almost a lifetime of thinking that the word was 'cavit', you now teach me that it is really 'cavil'. Thank you 1grammardude'. I hope you get to try some more Spanish wines soon as they blend the best of the old world (sense of place [terroir]) and the new world (ripe fruit). I'm sorry to hear that you have to deal with the PLCB :-). 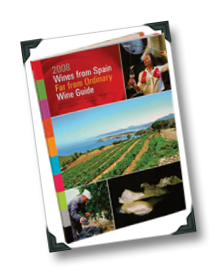 Have they run out of the "Wines From Spain Far From Ordinary Wine Guide"? I ordered one back in October or November and still have not received one. Will they be coming out with a 2010 version? I don't know about any revisions, but I do recall that it took some time (several weeks) for the book to arrive. I'd try contacting them, seems quite a long time and I'd have thought you'd have received it by now.